​Eventhough Airfryer is not a major invention of the century that changes the course of human history, it certainly changes the life of many housewises/husbands significantly in a better way. It also brings up a new cooking lifestyle with health benefits." It works by cooking your food using super heated air that it circulates within its chamber. A fan inside the air fryer helps circulate the hot air and help the air fryer create a reaction called the Maillard Effect. Maillard effect, named after the French chemist Louis-Camille Maillard, is chemical reaction characterized by the bonding of amino acids and reducing sugars. This chemical reaction is most notably known on how it gives browned food its unique taste and aroma. Some examples of browned foods are biscuits, bread, steaks, fried dumplings, and much more. Due to our changing and fast-paced lifestyles, people are finding less and less time to prepare healthy and nutritious dishes. They needed a machine that could cook them food that is not just convenient but also healthy. Alongside with the fact that processed foods and fast foods are getting fatter and fatter, people needed a way to prepare meals that are not only nutritious but also low in fat and cholesterol. Thus, the air fryer was born! In the third quarter of 2010, Philips Electronics Company introduced to the world an appliance like no other, a first of its kind. With Philips’ current motto “Innovation & You”, they had certainly taken into account the needs of Philips’ customers and innovated with it. 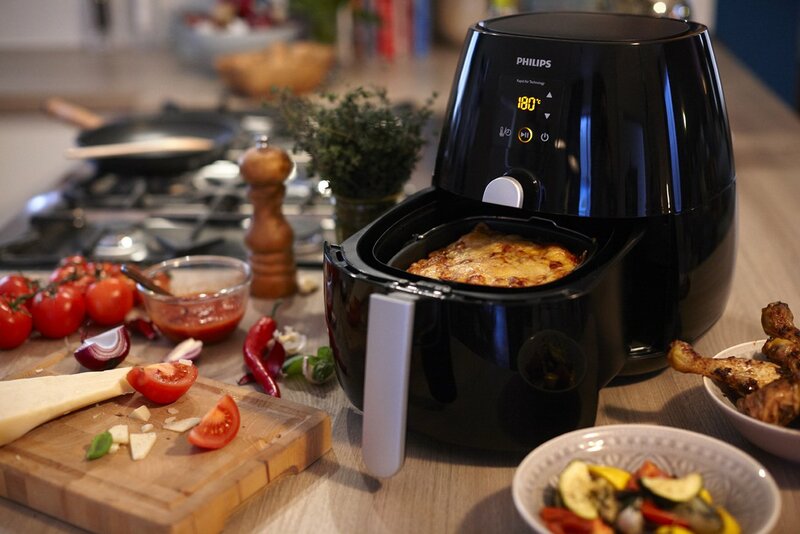 Philips Electronics Co., claim that the dishes that are cooked with the Air Fryer contain up to 80% less fat. That is a massive decrease from the grease that you ingest every time you eat oily foods such as French fries, chips, and much more. The company also claims that the appliance is not only limited to cooking dishes and entrees but also desserts such as cakes, cookies, and more. Ever since then, the Philips Air Fryer had hardly changed their design or their features. It is a testament that the first one was as god as it can get and that it can already perfectly serve its purpose without having to reinvent. Philips boasts the convenience, economical, and ergonomic benefits of the Air Fryer, which is why dozens of companies worldwide had then tried to replicate the success that the original Philip Air Fryer is. Some similar products that have since popped up in the market are the Go Wise USA Air fryer and the Avalon Air fryer. All of which have advantages and disadvantages compared to their competitions, and the first Philips Air fryer. The Air fryer may go down in history as the first appliance to help people prepare food almost instantly but without excessive fats and unwanted oils. Whether it really is or not, one thing is for sure, you can cook damn healthy and nutritious foods with the air fryer! Air Fryers are the newest trendy appliance in the market. It helps you prepare a batch of delicious foods without worrying about the grease and fat in your body shooting to the stars. Here are 10 easy dinner recipes with the use of air fryers. Save time - you would not want to spend too much time preparing your meal after a long working day, would you? just keep it simple. Easy and convenience - with a couple of available ingredients, a good Air Fryer and a little bit of handwork, you can cook almost like a restaurant chief. Used for emergency cases - whether you want to greet unexpected guests decently or you're about to go out and still want your stomach stuffed, these are the recipes that would help. In this recipe, you’ll be needing a pound of bacon, and four pounds of shrimp. To do this, wrap each shrimp (after peeling them) with thinly sliced bacon strips. Start from the top of the shrimp going down to its tail. Refrigerate the shrimps for about 30 minutes. During that time, preheat the air fryer to 380°F. Take the bacon shrimps from the freezer then cook them in your Air Fryer for 7 to 8 minutes. Drain any excess oil and enjoy! To make this, you will be needing 12 ounces of skinless chicken tenders, soy sauce, sesame oil, ginger, scallions, pineapple juice sesame seeds, pepper, and garlic cloves. Using barbeque sticks, skewer the chicken tenders. Combine all other ingredients into a bowl, their quantity depends on your taste. Marinate the skewered chicken for at least two hours and cook for 6-7 minutes under 380°F. Prepare small button mushrooms, crushed garlic cloves, slices of bread, black pepper, parsley, and olive oil. Place all ingredients except the mushroom in a food processor then grind them until fully mixed. Remove the mushroom stalks then fill the mushroom head with the grounded ingredients. Cook for 7-8 minutes. Ready some ready-made dough, olive oil, mushroom caps, mozzarella, tomato sauce, salt, pepperoni, and any other Italian seasonings you want. Cover the top of the dough with the olive oil followed by the tomato sauce. Then evenly place all other ingredients on top of the dough. Cook the prepared pepperoni pizza for about 10 minutes at 330°F. For this, you will be needing ¾ pound chicken tenders. Prepare the breading by mixing eggs, all-purpose flour, black pepper, bread crumbs, salt, and olive oil. Coat the chicken tenders with some beaten eggs, then cover it with the breading that you have prepared. Cook the chicken tenders for 15 minutes at 360 °F. Enjoy with your dip of choice! Prepare some ground beef, cheddar cheese, burger buns, salt, and black pepper. Season the ground beef with the salt and pepper then form them into patties of your chosen size. Cook the patties for about 10 minutes at 390 °F. Place the cooked burger patties along with the cheddar cheese into the burger buns and enjoy your own delicious homemade cheese burger! For those who are into light dinners, you will need white bread, sliced cheddar cheese, and melted butter. Preheat your Air Fryer to 360°F. Gently brush the insides of the white breads with butter then place one slice of cheese between two white breads. You then cook it for five to seven minutes or until golden brown. Enjoy! Preheat your trusty Air Fryer to 390°F. Cut the fish of your choice into 2.5 inch long and 1 inch wide strips. Cover it with beaten egg, then dip it on a batter made out of all-purpose flour, olive oil, egg, salt, and bread crumbs. Apply as much as you want. Cook the fish nuggets for 10 minutes or until it looks golden brown to you. Serve it with a mayonnaise dip! To cook this delicious meal, you will need to prepare 1 and a half pounds of tiger shrimps, salt, olive oil, black pepper, smoked paprika, and old bay seasoning. Combine everything in a bowl, make sure that the shrimp is well covered by the oil and spices. Cook the shrimps for 5 minutes at 390 °F. Cut the salmon into 6 ounce portions, then drizzle it with olive oil, and a pinch of salt. Cook the salmon in your Air Fryer for twenty to thirty minutes at a low 270°F. Make the Dill sauce in a bowl by mixing nonfat yogurt, salt, sour cream, and finely chopped dill. Enjoy with a nice glass of wine! These 10 dinner recipes are extremely easy to prepare with an Air Fryer and still put out the best dishes to enjoy." Is an air fryer best alternate to deep frying? Oily food is not good for the health as it leads to obesity, heart diseases, stretch marks and many more. With such massive side effects people still love to eat oily food as it is more delicious than dry food. 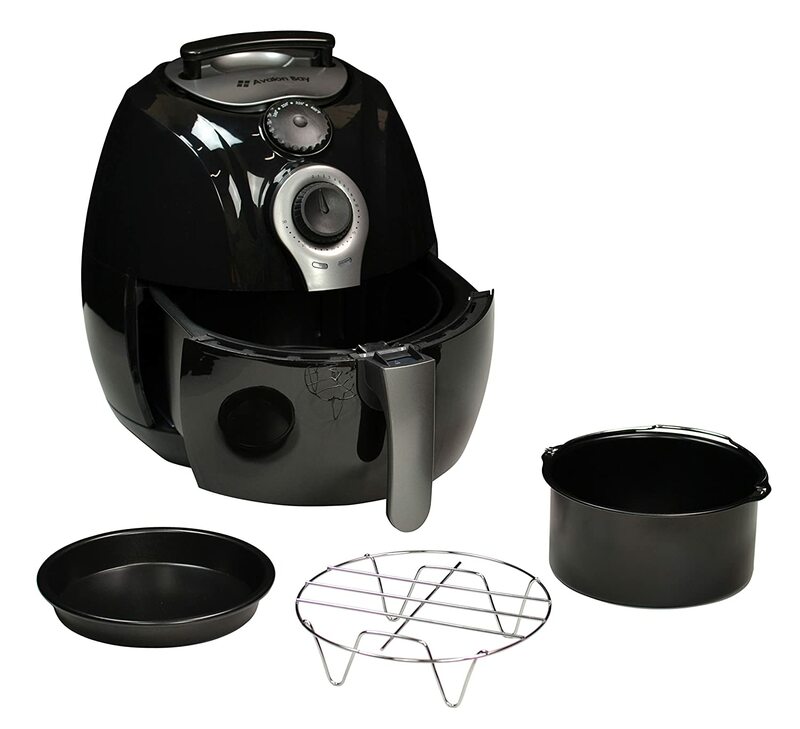 A person cannot resist himself from eating oily food because of which a special kitchen appliance,air fryer is released which cooks food in lesser amount of oil without disturbing the taste. Deep frying is quite risky because if oil gets spilled then it will cause severe harm to the individual cooking food. But this is not the case with air frying, because the food is being fried inside the boiler which is placed inside the stainless steel body of this kitchen appliance. Large amount of oil is required in deep frying and oil once used cannot be used again and again for frying. So, in order to enjoy delicious fried food a lot of oil is wasted which proves out to be quite expensive. Air frying requires a very less amount of oil, which allows you to enjoy fried food with delicious taste which proves out to be quite economical as no oil is being wasted. Deep frying is not at all healthy as it contains a lot of oil and sometimes oil deposits on the cold food which is hard to digest. Moreover, improper digestion can lead to constipation and other severe health issues. So, get air fryer and enjoy delicious and healthy fry food which are easy to digest because this kitchen appliance uses rapid air circulation technology which cooks food from all the angles. Moreover, with less oil used the air food is less on calories and fat which keeps people away from major health problems. This kitchen appliance is easy to operate. It also comes with auto shut off feature which automatically turns off the heating coil once the food is properly cooked which protects the food from getting over cooked. So, use air frying instead of deep frying to easily cook delicious fried food with perfect taste. This kitchen appliance is easier to clean than the utensils used in deep frying. The tray used to cook food is removable and is quite easy to clean because of its smaller size. Air frying has numerous benefits and is definitely the best alternative to deep frying. You can also cook multiple dishes at the same time, which saves time too. So get this appliance as soon as possible to enjoy fry food and several other food dishes with a perfect taste.